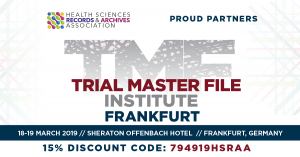 A brief reminder that the early-bird pricing for the upcoming TMF Institute Training ends this week! In addition to courses on TMF Foundations, Interoperability & Cross-functional Integration, and TMF Management & Collaboration, the HSRAA is running a one-day training programme entitled ‘Electronic Records Management‘. This covers all of the regulations pertaining to the management of electronic records, as well as practical help and advice on archiving, email management, and data migration…. to name just a few topics we’ll be covering. Check out the website (http://bit.ly/2SydWBw) and remember to use discount code 794919HSRAA to receive a 15% discount. Note: this is NOT a conference. It is two days of high quality, comprehensive training, delivered by experienced industry colleagues. What could be the Impact of Artificial Intelligence on Records Management?